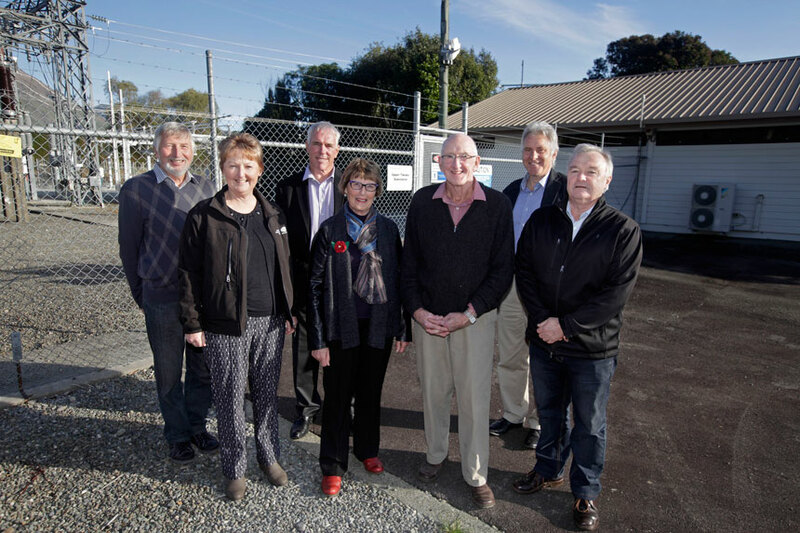 Pictured from left to right are Jim Williamson (Network Tasman Ltd Director), Sue Brown (Provincial President, Federated Farmers), John McCliskie (Network Tasman Ltd Chairman of Board of Directors), Elva Harwood, David Harwood, Murray Hendrickson (Network Manager for Network Tasman Ltd), and Tony Reilly (Network Tasman Director). Consumer-owned lines company Network Tasman officially opened its new Upper Takaka Zone Substation on Friday, 3 June – unveiling a project that local farmers are hailing as a welcome investment in the region. Building the new substation involved installation of 66/11kV transformers and switchgear at the site and local farmers have already noticed an improvement in the quality of the electricity supply. Sue Brown, Provincial President of Federated Farmers, says that a better electricity supply has given farmers confidence that their dairy farm operations will run smoothly in the future. It has also meant that local farmers the Harwoods have been able to invest in additional plant for their on-farm hydro-electric power station that powers the property’s irrigation system. “The Upper Takaka substation project was driven by the need to reinforce Network Tasman’s distribution system in the Takaka Valley,” said the Chairman of Network Tasman’s board of directors, John McCliskie. “Dairy, irrigation and other load increases were pushing the limits of supply to many of our rural customers to its limits”. “The Harwoods’ hydroelectric station is an example of what this project is all about - providing electricity infrastructure that meets the needs of consumers on our network in Upper Takaka by providing a safe, reliable, fit-for-purpose lines network. We expect that the new zone substation will serve consumers in the Takaka Valley for at least the next 50 years. “This project is just one of many ongoing capital investments that Network Tasman is making throughout its coverage area to ensure that consumers on its network have access to reliable and secure electricity supply. The Network Tasman board of directors approved the $1.95 million budget for the project in August 2013 with work beginning in earnest once the Motueka and Golden Bay 66kV assets were transferred from Transpower to Network Tasman in 2014. Edison Consulting was engaged to complete the detailed design and manage construction through a competitive tender process. Electronet Transmission was the successful tenderer for the build itself.